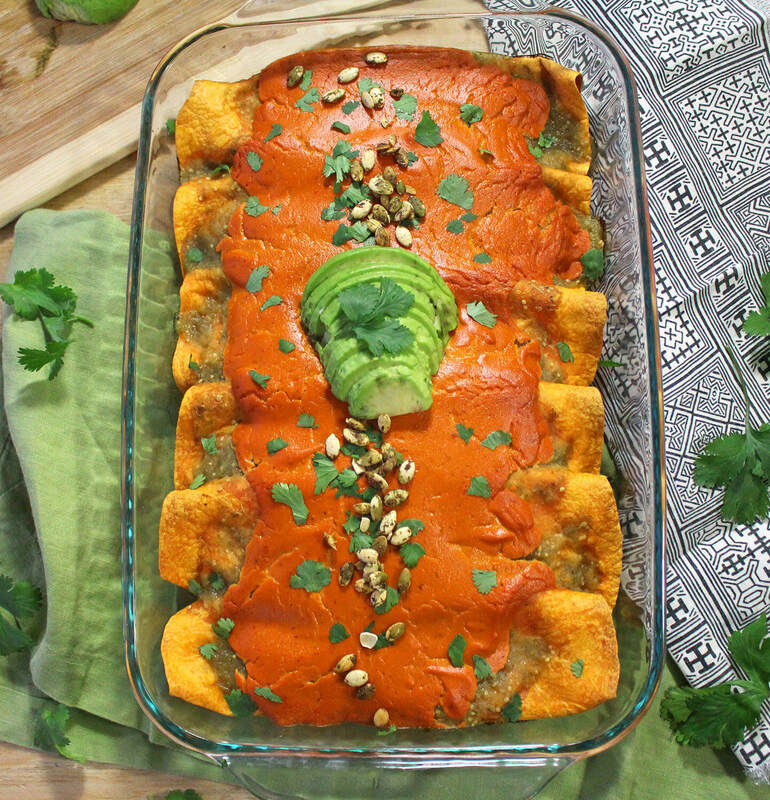 These sweet potato and black bean enchiladas are the BEST vegan enchiladas I have ever made! I am so excited to finally share this recipe with you after 3 tries perfecting the perfect salsa-to-cheese ratio and perfecting a gooey, flavorful vegan cheese that gets just the right level of browning in the oven just like the real deal! 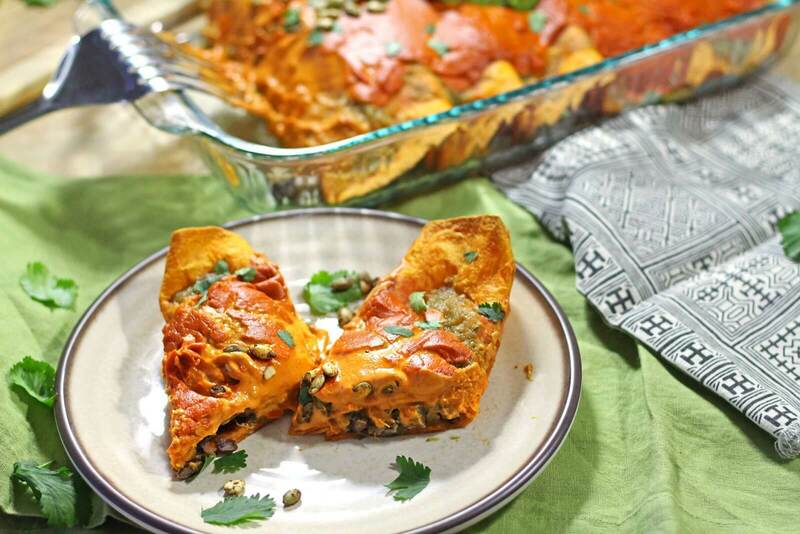 These enchiladas are simply stuffed with a mashed sweet potato and aromatic spiced black bean mixture. I used chili-lime tortillas for an extra kick. They are then covered in tangy salsa verde and the most amazing roasted red pepper and chipotle cashew cheese! They are ready in less than an hour. Avocado, pepitas, and cilantro make great toppings! 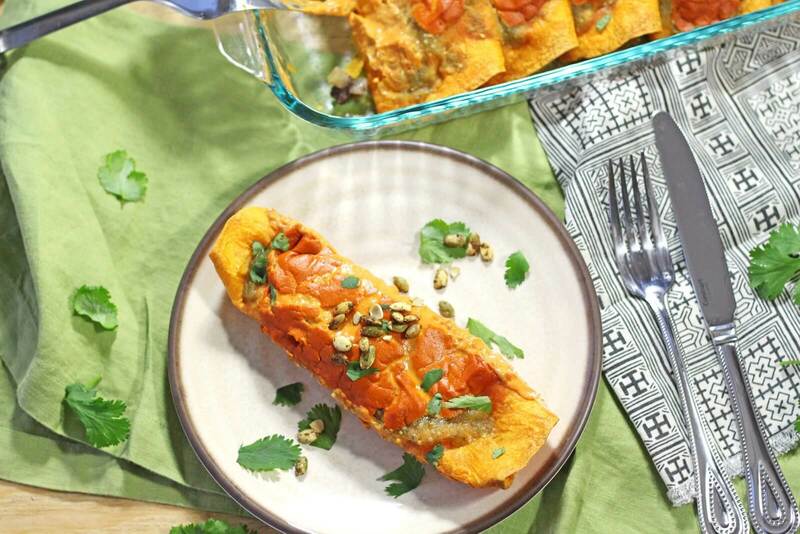 The best sweet potato and black bean enchiladas covered in tangy salsa verde and a gooey, vegan chipotle cashew cheese. Peel and dice sweet potatoes, and add to a pot of boiling water. Reduce heat to medium low and cover, simmering for 15-20 mins, until soft and easily pierced with a fork. Remove potatoes and mash them with a fork or potato masher in a medium bowl. Drain black beans, reserving 2 tbsp of liquid. Sauté diced onion in oil until translucent over medium heat, 3-5 mins. * Add garlic, cumin, black beans, liquid, and salt, and sauté for about 5 more mins, until fragrant. Set aside black bean mixture. Blend all ingredients for chipotle cashew cheese in a high speed blender until smooth. Start with 2 tbsp of water and if too thick, add more water 1 tbsp at a time. Put ¼ cup + 2 tbsp salsa verde at the bottom of a 9x13 baking dish and spread around evenly. If the tortillas need to be softened to work with, microwave them. 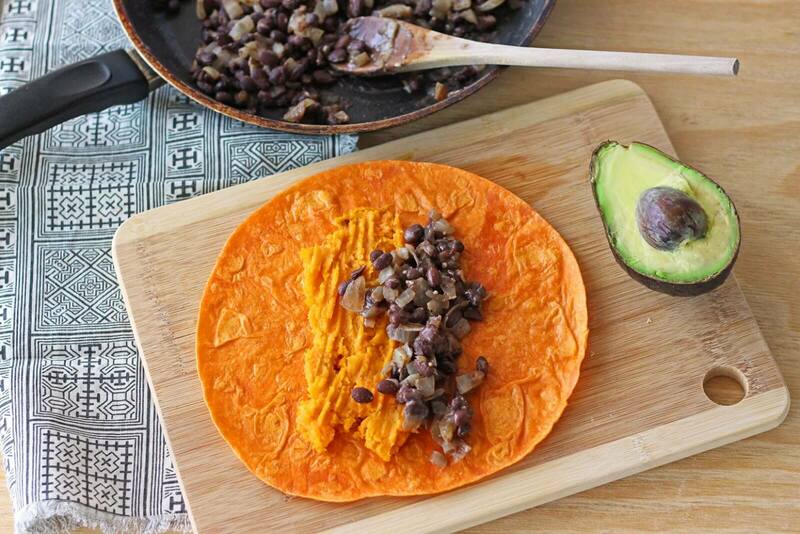 Divide the mashed sweet potato and black bean mixture amongst 5-6 tortillas, and place seam side down in the baking dish. Top with ¼ cup + 2 tbsp more salsa verde, adding more if desired. 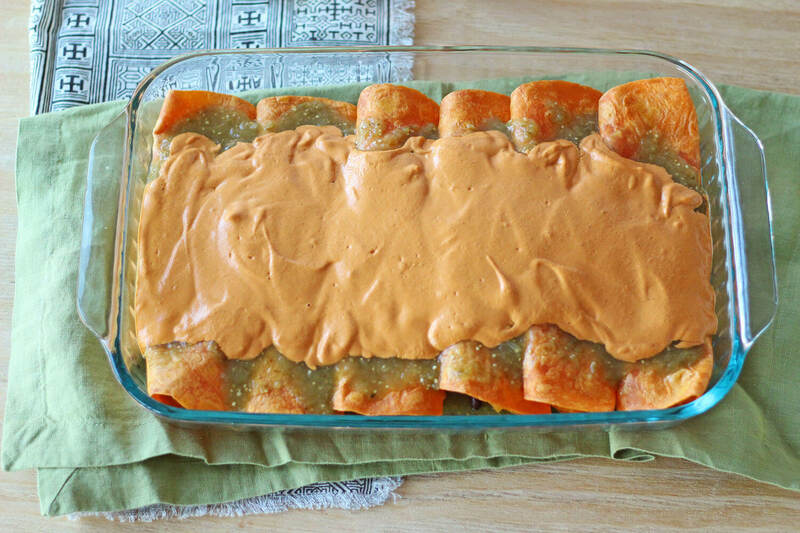 Pour cheese sauce over enchiladas and smooth with a spoon. Bake for 12-17 minutes. Remove from oven, top with cilantro, pepitas, and avocado, and serve! Enjoy! *Oil-free method: simply use 2 tbsp of water to sauté the onions and garlic instead of oil, until soft, fragrant, and translucent. Gorgeous sounding dish : ) May I ask, what type of tortillas are they? They look orange in colour. Thank you!